first impression | This new spot in the Cortex is the latest venture from the folks at Bissinger’s, and it is pure urban elegance. Blonde wood walls curve around booths in the wide open space, where elevated comfort food surprises you with amazing flavors you never knew could come out of foods like Brussels sprouts and sorbet. The kitchen is led by chef Patrick Russell, who trained at New England Culinary Institute and came here from Field & Main in Virginia. A welcoming bar is manned by friendly mixologists. I recommend reservations, but you also can sit at the bar or the open ‘dessert kitchen’ and watch the pastry chef work his magic. Naturally, many of the foods, both savory and sweet, incorporate Bissinger’s chocolate. 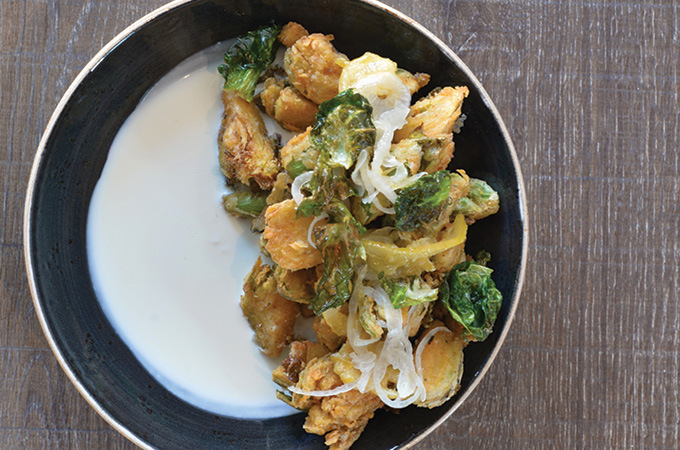 » chicken fried brussels sprouts: $9; Start with these battered goodies, served perfectly crisp and sprinkled with pickled white onion bits. » bacon flight with herbed white chocolate: $16; A good choice for the table, three bacon pieces each get an elaborate treatment. Beef bacon is drizzled with a sweet, molasses-like soy sauce and served over pungent, mouth-puckering kimchi. The traditional pork bacon sits atop peppery arugula and is flavored with sherry and coffee. Lamb bacon comes draped over a robust olive and caper tapenade designed to temper its distinctive flavor, but I still found it too gamey. In the center was a purée of white chocolate. » seared diver scallops: $32; Gigantic scallops came with a perfect sear on both sides, scattered over deliciously creamy butternut squash purée, smoked mushrooms and crisped Brussels sprouts leaves. Also on the plate: a cold pumpkin relish. » braised lamb shank: $28; The meat was flavorful and fall-off-the-bone tender as it nestled on creamy polenta. A smattering of crispy fried leeks added to the fat content (in case the lamb isn’t rich enough). » peanut butter bomb: $7; A dark chocolate dome reveals decadent peanut butter mousse inside with a drizzle of hot berry sauce. The entire dish, which includes cookie crumbles and nitrogen-frozen berries, is a juxtaposition of sweet and salty, warm and cold, smooth and crunchy. » passion fruit tart: $8; Exotic fruit compotes are served alongside a gelatinous fruit pie wedge and coconut white chocolate sorbet, which was outstanding. The bar here is very active with a dozen boutique cocktails and several local brews on tap, as well as wine and bottled/canned beer. The menu is heavy with exotic rum drinks, including our pick, 30 Minute O. It may look like a milkshake, but its dose of overproof Jamaican rum is boozy, despite the white cocoa and dark chocolate shavings on top. There’s some banana liqueur in there, too. This is a must-visit. Besides its cool atmosphere, the food is amazing. Flavors are strong and exciting, and portions are pleasantly adequate. Head to the Grand Center Arts District this weekend for Saint Louis University Theatre’s production of Godspell, a journey through the parables of Jesus. The musical is directed by Stephanie Tennill. Engage your creative senses at Fontbonne University’s BFA, MA & MFA Thesis Exhibition, a special show of senior and graduate students’ thesis artworks. An opening reception will take place at 6 p.m. April 26. Round up your favorite partners for Winter Opera Saint Louis’ Big Band Dinner Dance featuring food, cocktails, wine and music by Caduceus, The Doctors’ Band. Enjoy the chance to dance with Winter Opera artists! 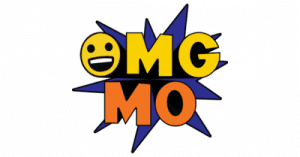 The Novel Neighbor is thrilled to announce that the OMG (Oh, Middle Grade!) 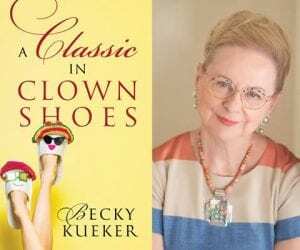 Book Festival is headed to St Louis! OMG BookFest is a celebration of books aimed at the early to middle grade reader (ages 7-12), bringing popular and award-winning authors together for an exciting interactive experience of games, activities, and reading. OMG is a traveling circus of books and authors that moves from city to city offering kids a chance to meet new and favorite authors in an engaging, high-energy and interactive environment. Readers will experience themed activities and a book signing with 24 OMG authors! In honor of Mother’s Day weekend, Vicia is hosting a springtime market. Enjoy lunch or happy hour snacks and pick up flowers, gifts, and farm-fresh produce and milk from their favorite farmers and artisans. Specialty goods from Vicia also will be available for purchase.